at Claimjumper #8. 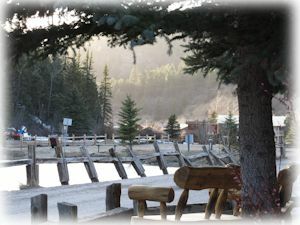 Enjoy snow skiing and winter sports in season, and in spring through summer, fishing in the nearby pond and stream. Nature and outdoors activities abound all year around. February brings Mardi Gras in the Mountains. Come join the festivities! 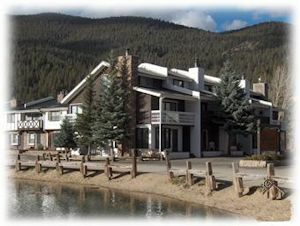 Red River is located in the heart of the Carson National Forest. Prepare to be blown away by the many scenic areas including the stunning Valle Vidal unit. Nearby Wheeler Peak is the highest point in New Mexico. Learn more at http://www.fs.fed.us/r3/carson/. You will find plenty of room to relax, play, and entertain in this spacious three bedroom, 2.5 bath townhouse. Amenities include new furnishings throughout, new decor, full kitchen and a cozy wood-burning fireplace. Comfortably sleep up to twelve guests! The master bedroom features a king size bed and private bath. A large second bedroom also has a king size bed. Two Queen beds as well as twin size bunk beds occupy the upstairs loft. Additionally, there is a Queen size sofa-sleeper in the living room. Pictured right: Winter view of the adjacent fishing pond and benches, in the foreground. You are near the base of the main ski lift. Relax and fish or visit nearby art galleries. Snow skiers love staying fifty yards from the base of the ski lift. Our "Claim Jumper 8" townhouse provides spectacular views of the ski area from every window and balcony. Your door is steps away from the river and right next to the fishing pond, both of which are stocked with trout for the summer. Located in the center of town, you and your guests will enjoy outstanding dining and diverse shopping venues. Art lovers will enjoy the numerous art galleries in Red River and Taos. Taos is just forty minutes away. For information on how to make this delightful New Mexico mountain townhouse yours for your vacation, call rates and reservations at the numbers below.